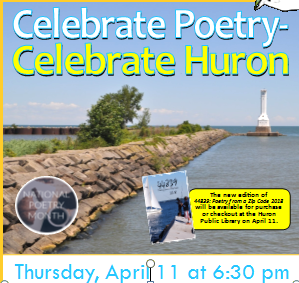 April is National Poetry Month and to celebrate Huron Library will be hosting a gathering of Huron Poets on April 11 at 6:30pm. All are invited to hear them read poems submitted for the Library’s 44839 Poetry Competition. At this event, contest winners will be announced and all entrants will receive a copy of the latest edition of 44839: Poetry from a Zip Code 2018. Copies of the book will also be available for purchase. No registration necessary.